New Year, Let’s get real! There is nothing like browsing gorgeous pictures online or in magazines, especially during award season. I want. I wish. I wonder. Sigh..
Having a makeup artist, hairstylist, great lighting and photoshop editors makes EVERYONE look great – trust me, I KNOW. At the start or end of my day, I don’t even come close to seeing a semblance in my mirror. Do you? I hate to be Debbie Downer, but those people in the photos aren’t recognizable in their mirror at home after the event – once everything is off. Good news: They are just as normal as you and I – only they have a BEAUTY TRIBE. So it’s a new year.. I want to help you with real beauty concerns, questions & frustrations. I want to give you real solutions, hope and inspiration! So let’s GET REAL! Who’s with me? Here is your first Beauty “TO DO” for 2016.. schedule in #MeTime this year & regularly! Whatever you have to do; add it to your calendar, phone, schedule an alarm or stratigically place sticky notes – DO IT & be consistent! Here’s list to help start you off. Were you NOT running around packing as much as possible into your days leading up to the holidays? Was I the only one? The largest organ of our body is our skin. It’s also the greatest “tattle-tale” of what’s going on in our life. It shows STRESS honestly. Take a moment, sit down and follow the instructions below to de-stress your skin and put this back in order, post holiday! Traveling and climate change take a toll on the hydration of our bodies and ultimately our skin. Water is so important for healthy body functioning as well as ALL of our cells. On average, our body is made up of 60-80% water.. So refill it consistently & often, and it will GLOW. 2. SUGAR OVERLOAD: Skip it & Detox. We all indulge more this time of year. Did you know that consumption of processed sugar actually breaks down the good fibers in our skin? I know. I’m bummed too. So go back to limited sugar and stick with the natural forms (fruits, vegetables) and a bite of dark chocolate every other day. 3. TOO MUCH MAKEUP: Wipe it off (well). This is the time of year we dress up more & add extra eyeliner. Take the time to do a second cleanse. Grab a toner with ingredients like salycillic acid, peptides, aloe & haulourinic acid so you are putting them into the skin as well as cleansing. You will be amazed at the amount of makeup residue you will wipe off your skin AFTER washing your face. 4. MORE LINES & WRINKLES: Mini facials. Start giving your skin more love to make up for all the stress. Do a scrub every other night. Add extra eye cream under your eyes. Apply a second layer of moisturizer for a hydrating mask while you sleep. Grab the green tea bags after brewing and apply to your eyes for 5-10 mins. You’re skin will thank you & bounce back. They call it beauty sleep for a reason. All our cells regenerate at night. Start winding down a few nights early and allow your body more time to rejuvenate. Not only will you feel better, you’ll look better! Promise. I’d love to hear what you think.. Do you have a specific post holiday skin issue? Please let me know. And your skin. Are you using it? Anti-oxidants protect skin from future sun damage as well as repairing cells of past damage (those darn free radicals). Let me say that again, Vitamin C helps the skin repair itself! It helps stimulate the production of collagen and elastin which slows down with age – hence the wrinkles. Internal consumption is extremely good for skin as well. Buffered Vitamin C has always been recommended as a good choice for better body absorption. Vitamin C is water soluble so you if it’s not absorbed by the body, it leaves. We need to replenish daily because look at all the health benefits..
Rodan + Fields Reverse Line (vitamin c & retinol combo) and the Sunscreen is the most hydrating I’ve ever used! So whether it’s finding a skincare line with Vitamin C, throwing an orange slice into your tea/water, munching on C based veggies (bell pepper, cauliflower, broccoli, spinach, collard greens, tomatoes) or supplementing your diet with buffered C (especially during cold & flu season) – start rev-ing UP your anti-aging routine today. Your skin & body will THANK YOU! I didn’t use toner for years. Another product? Another step? No way.. I already have/do too many. I don’t need that (with laughter filling my head). Sound familiar? Then I did an experiment. 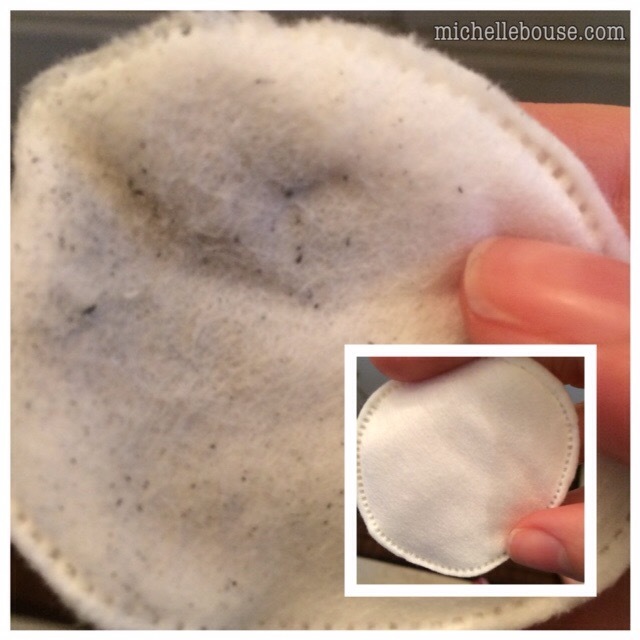 I took a clean cotton pad after using my best cleanser, applied some hydrosol and I wiped. Hmmmm how can that be? Then I applied all my skincare products and went to grab some much needed beauty sleep. The next morning, knowing my face was as clean as a whistle I took a cotton pad, applied some more hydrosol and wiped.. YIKES! How was it possible with a clean face and doing nothing but sleep, I still have sweat & dirt on my face. That was the day I started using toner. Here’s a picture from this morning.. Guess my mascara wasn’t all off last night. Thank you toner.. I have to say I love you! Did I change your mind? Or do you already use toner? Please share with me in the comments below. It’s SuperBowl Sunday weekend. Is there anyone else not into watching it or is it just me? Well here’s what I will be doing.. SuperBowl SPAday! Self pampering beauty.. Way better than football (at least to me) but maybe I’ll peek at the half-time show. Start by lighting some candles (watching a flame lowers blood pressure), choosing some music (can’t go wrong with Classical or George Winston), pull out your favorite read (I’m addicted to Outlander right now) and pour yourself a beverage. Pull your hair back with a tie or headband and slip into comfy clothes and slippers. Take out the packet of sugar and empty it into your hand. Mix a drop of your favorite cleanser into the sugar and apply to your face in circular movements. Use warm water to wash your face with the mixture and give extra attention to any dry spots (nose, chin, lips). The sugar will exfoliate and dissolve within the water as you wash (brilliant). Rinse your face with cold water to close your pores and pat dry. Apply a thin layer of coconut oil all over your face and follow by spreading a teaspoon of honey to your entire face & neck. Pat the honey with your fingertips all over your face for about 1-2 minutes. This stimulates the cells and encourages product penetration. Apply coconut oil to your cuticles and grab a book, sitting with your feet up in front of the candles. If you want to relax instead of read, apply one wet green tea bag to each eye and close. Allow yourself to sit for 15-20 minutes with the honey on your face. Then massage remaining oil into cuticles, remove tea bags, rinse face and pat dry. Follow with one more application of coconut oil to your face & neck, apply your favorite eye cream and top with your moisturizer. The honey and coconut oil will hydrate your skin and leave it feeling baby bottom smooth (and won’t clog or breakout skin). The green tea bags will help hydrate, eliminate puffiness and firm. If you want to sneak a peek at the television, now would be the time or just put your feet back up and enjoy YOU. Let me know if you’ll be enjoying the game or pampering yourself. If you like this post please tweet it, pin it, re-pin it and share it with your friends! and of course comments are ALWAYS loved..